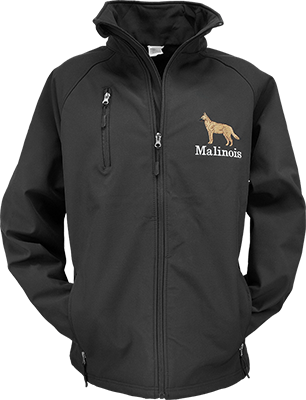 This soft shell jacket is great to work your dog on those chilly days. It's functional, membrane-bonding water repellent technology keeps you comfortable and dry all day long. It is waterproof, windproof, and ventilated to release moisture. The bottom has a toggle drawstring to keep the wind and cold out. The hook and loop cuffs are also adjustable. The easy to access zipper pockets of this jacket are another great feature. The top pocket is an excellent spot to keep your training items or treats while working your dog. Two bottom pockets gives you even more versatility and space. Represent your favorite breed with one of our breed specific embroidery graphics! Choose from 121 different graphics. Our embroidery graphics are done with high count, durable, high sheen, polyester threads. Click here to see samples of embroidery graphics.